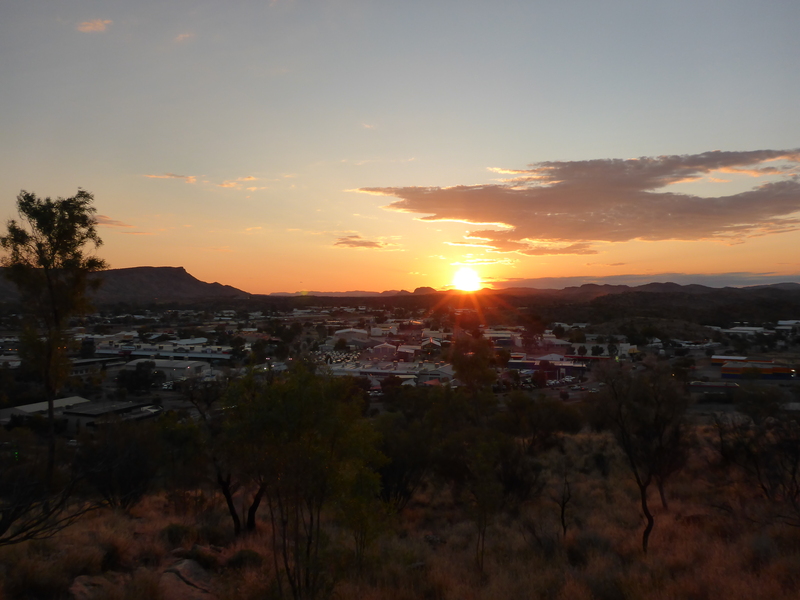 Alice Springs, NT. 17th August 2015. Crossing the Tropic of Capricorn. Heading south to Alice Springs. A haircut. I desperately needed a haircut. There are a couple of salons in the town centre, an easy ten minute stroll from the hostel. After a young lady from Chingford, Essex, had tidied up my head , I felt better and got some other things organised. I rang up a bike shop and asked if I could use a corner of their workshop to service my bike. The guy there realised I was a Pom and started moaning about the Ashes. We enjoyed a bit of banter and he agreed to help me. A job for tomorrow then. Next was something I should have done as soon as I arrived in Australia, which was to register for Medicare. The UK and Aus have reciprocal arrangements but it’s necessary to get yourself on their system. You then get issued a card which is shown if you need to use the health service. 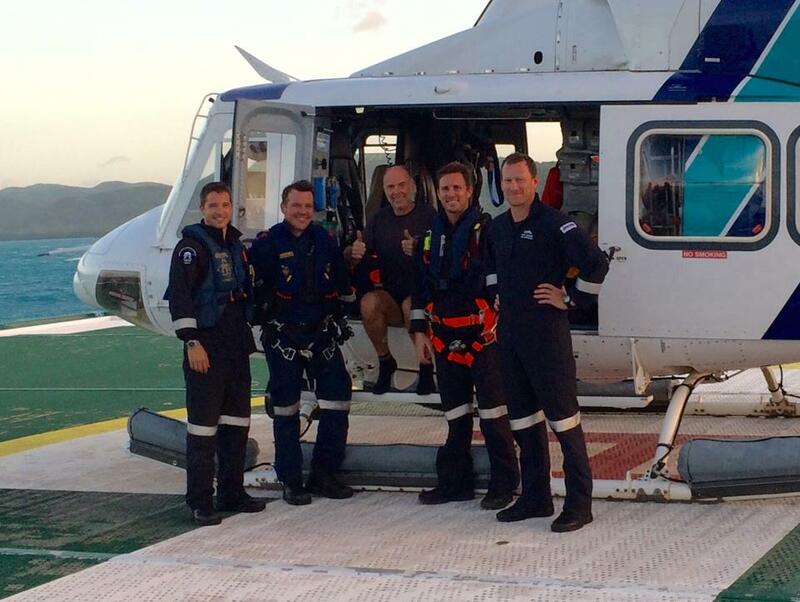 My little stay in hospital on Thursday Island had brought this home to me. It was easy to do, at the multi purpose government contact centre in the town. They just wanted to see my passport and visa. The card will get sent to Phil’s and he’ll send it on to me. A view of Alice from the top of ANZAC Hill. Next was to go to the post office and get my new camera. I had to wait another day for that to arrive but it was good to get it at last. Phones are all well and good but nothing as good as the real thing. At a camping shop I replaced the items that had been lost or damaged up on the Tele Track and also bought a collapsible mug. What a great idea. It compresses down to nothing when not in use and saves me space in my bag. 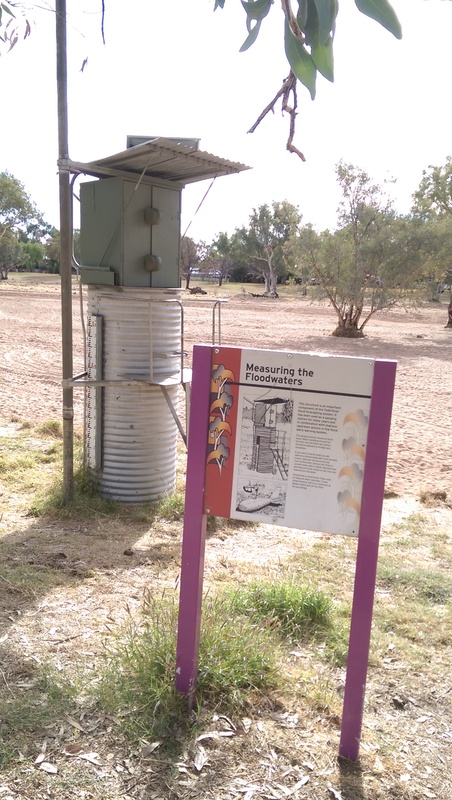 Alice Springs visitor centre organise a walking tour, for free, that leaves at 09.30 on weekdays. It’s best to book it, just to make sure you can get on it. So I did, but when I arrived next morning it had been cancelled. Very annoying but the guy there did mention a big truck festival that was taking place the following weekend. ‘And you’ll find that all the accommodation is booked out,’ he helpfully advised me. Bugger! I had plans to be away from Alice over the coming weekend but would definitely be back for the next one. Luckily there’s another hostel just round the corner and they had vacancies there for when I was due back. It seems there was a Festival of the Desert taking place at the same time as the truck festival and everywhere was booked out on the Friday. I was pleased to have got sorted out then. You wouldn’t think it during the Dry, but flooding can be a problem. Having failed to get on the walking tour I decided to go on my own walk,a 4km stroll along the Todd River, out to the Old Telegraph Station. Unlike the one at Tennant Creek, this one had all the original equipment still in it. They wanted an entrance fee to this one. I’d left my wallet behind. Clearly not my day for visits. Feeling the need for some exercise, and determined to be a tourist at least once before I left the town, I took a walk up ANZAC Hill, situated not far away from the hostel. I had my new camera in my pocket, spare battery installed as the new one was on charge. There were a number of display boards around the edge of the viewing area, detailing Australian forces’ involvement in various conflicts since the Boer war. Of course there was a war memorial. And, at that time of day, there was the sunset. Except ……. The spare camera battery didn’t have much charge in it (I later realised it was worn out). So I got a few shots of the ANZAC displays and about two of the sun as it set behind the MacDonnell range. ‘There’s always my phone camera,’ I thought. Not when the phone only has 10% charge in it. So another two shots and it was time to head back. Tell me why I don’t like Thursdays! By the time the BBQ came round that evening I felt really organised. Short hair, serviced bike, new equipment, new camera, everything now on charge. My fuel bladder had yet to arrive but I didn’t need it for this trip and was coming back, so I wasn’t worried. Another successful job had been to locate the tiny leak in my air mattress and successfully repair it. I think I’d earned my sausages. Heidi was very impressed when I contributed a couple of cakes to the general food fest. They went quicker than the meat! Artwork on the side of Coles supermarket. I had plans. Not only did I have them, I’d acted on them too. I’d booked in at the YHA hostel down at Yulara for two nights. This is the resort which is close to the Uluru National Park. I had been intending to camp but the fee was $38 per night for two people, no single bookings. The hostel was $34 per night. Easy decision really. 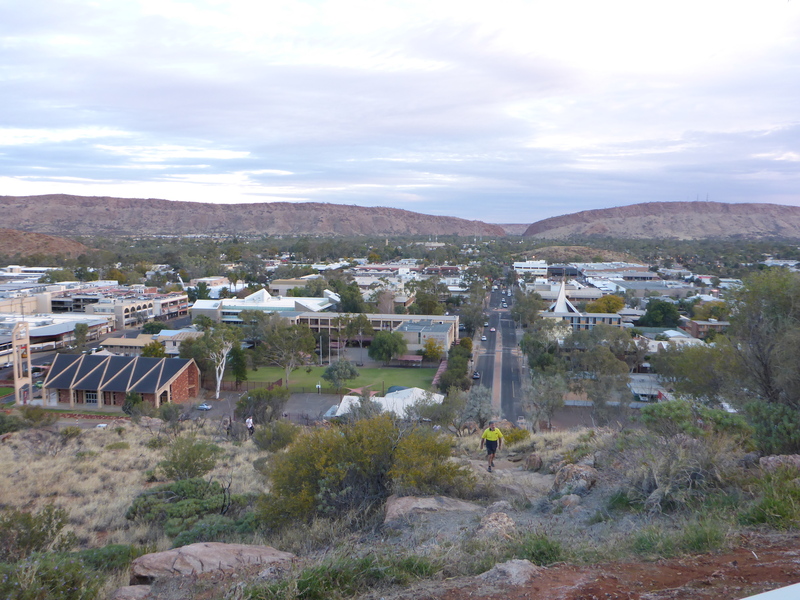 I was going to take two days to get there, with plans to visit some of the attractions out in the West Macdonnell ranges on the way. The map showed several gorges, canyons etc, enough to keep me busy for a couple of days. The distance wasn’t too far, allowing plenty of time for visits. No need to book at the campsites en route, there’s always room for one man and his tent. Before leaving town next morning I called in to the Visitor Centre to obtain a permit to travel on the Mereenie Road. When travelling across Aboriginal land holdings a permit is sometimes required. ‘Oh, we don’t issue them to motorcycles,’ said the nice lady behind the counter. My next question was obvious: ‘Why not?’’We’ve had drivers complaining about the condition of the road.’ Drivers? Of cars? It seems so. Why was this relevant to motorcyclists? And why do drivers complain about the condition of a dirt road? It’s a dirt road!! I asked if there was anywhere else I could get one and she suggested one of the roadhouses ‘because they’re not so concerned about the rules.’ I suggested she should tell anyone who complained to start behaving like a grown up, and then left. 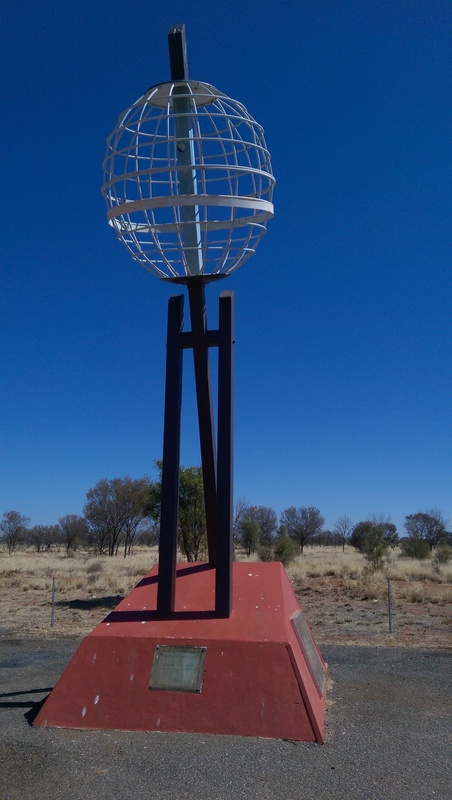 The area I was about to explore is referred to as the Red Centre of Australia. Why? Well, firstly it’s in the middle of the country and secondly the landscape is red – very red. It’s all that sandstone, laced with iron ore dust. Water, algae and lichen effectively ‘glue’ the dust to the surface of much lighter coloured rock. 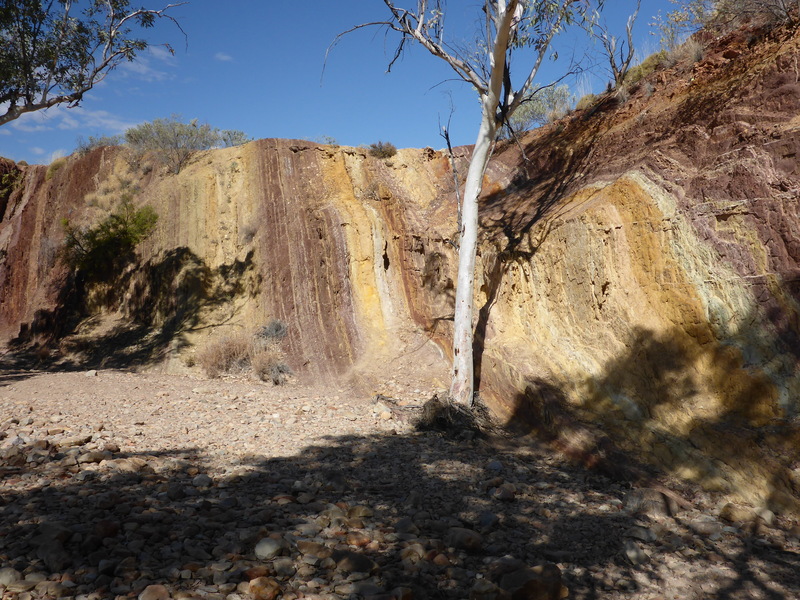 One thing Australia isn’t short of is in-your-face geology. First visit was to Standly Chasm. On Aboriginal land and a fee to pay of $10. It was a nice walk up there and the smooth rock on the lower part of the rock walls suggested a flood height of about eight metres. That’s high! Above that level plants get a toehold in the rock and seem to do very well. I got chatting to a family and when I said I was from London, Dad asked his young son if he’d heard of it. He said he had, it’s in Paddington. It seems he likes Paddington Bear cartoons. The entrance to Standly Chasm. Next was Ellery Creek Big Hole. It’s a big, deep, cold waterhole which never dries up. Despite the cold water, people were swimming in it. Mind you, the sun was getting very hot. In the car park I got chatting to Roley and Kaye, from Adelaide. They gave me their details and suggested I get in touch when I get there. 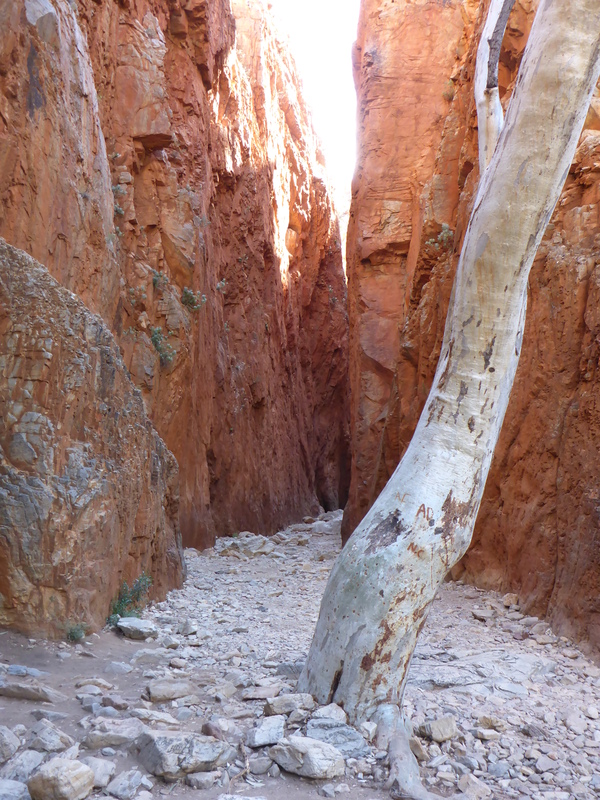 Then to Serpentine Gorge which involved a kilometre walk from the car park. Near the gorge entrance were parked a couple of Rangers’ vehicles. When I got there the three of them were swimming back across the waterhole from the gorge, having been in there checking up on some fish and frogs. This is clearly a well rehearsed routine as they had were stripped down to their underwear with their cloths packed into bags which were sat on top of rubber rings to keep them afloat and dry. The very cold water blocked the entrance to the gorge proper and none of we spectators to this little drama felt like crossing over. The Cold Rangers. The things you have to do to earn a living, eh! Last visit of the day was to some Ochre Pits. These have very special significance to the Indigenous people. Ochre is, as far as I can work out, a very hard packed mud, almost soft rock, and comes in various colours. It’s used mainly for decorating the body during ceremonies but also in medicine and has various other uses too. The red ochre is the most valuable and is often used to represent the blood of their Dreamtime spirits. These pits are men only, women are not allowed in them, they have their own. However, men can give the ochre to them if they choose. 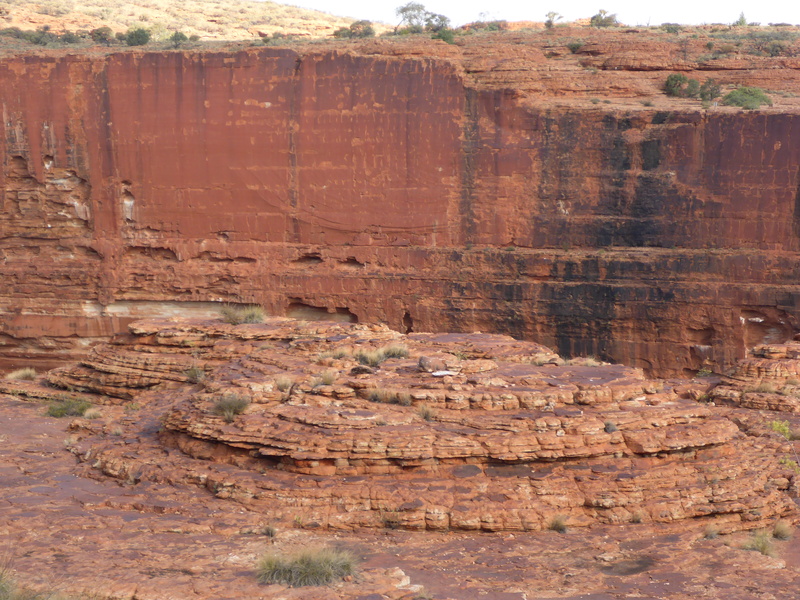 The cliffs that contain the ochre are next to a creek and the sides are sheer. There are several different colours and the water has worn some amazing patterns as it’s flowed past. The photos tell a better story. I can only say it looked fabulous. The Ochre Cliffs. Water worn patterns of colour. I reached Glen Helen Gorge camp site, filled my fuel tank and pitched my tent. They wanted to charge $2.20 for the privilege of using my credit card. I paid cash, obviously what they wanted people to do. What a scam. I took a walk down to the Glen Helen Gorge and found, once again,a body of water blocking the entrance. These permanent waterholes are vital to people and animals, enabling them to survive on an otherwise waterless terrain. Many species would simply not be there at all otherwise. The mammals include Wallabies, Kangaroos and Dingos, and there are always many different birds around. Australia is a wonderful place for birds and I’ve really enjoyed hearing new birdsong everywhere I go. 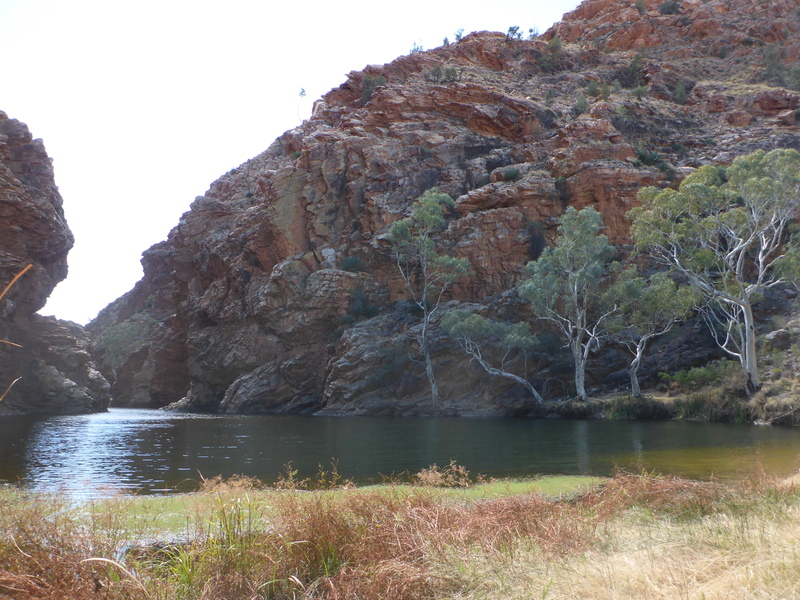 Most of the waterholes are part of the Finke River system. In common with many others in Aus, this river never reaches the sea, simply disappearing into the sand of the desert. 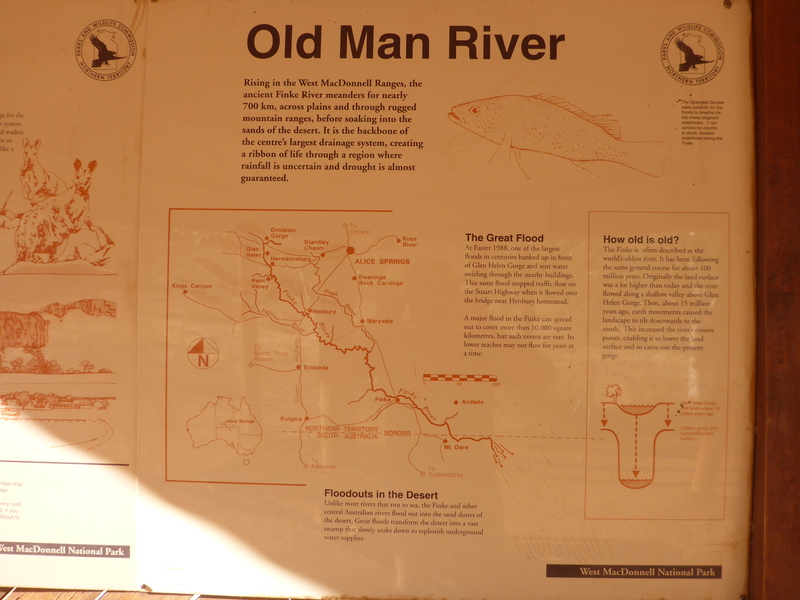 I read an interesting info board next to the Todd River, in Alice Springs. It said that many of Australia’s rivers are upside down. Meaning that most of the time all you’ll see is the sandy river bed but you don’t have to dig down very far to find the water that’s invariably underneath. I was very impressed by one of the other campers here. He had a big Mercedes coach converted into a camper. He towed a small fourby around on a trailer and would tend to stay in one place for a week or two and explore the area in it. Not so unusual. But the name he gave his coach amused me. 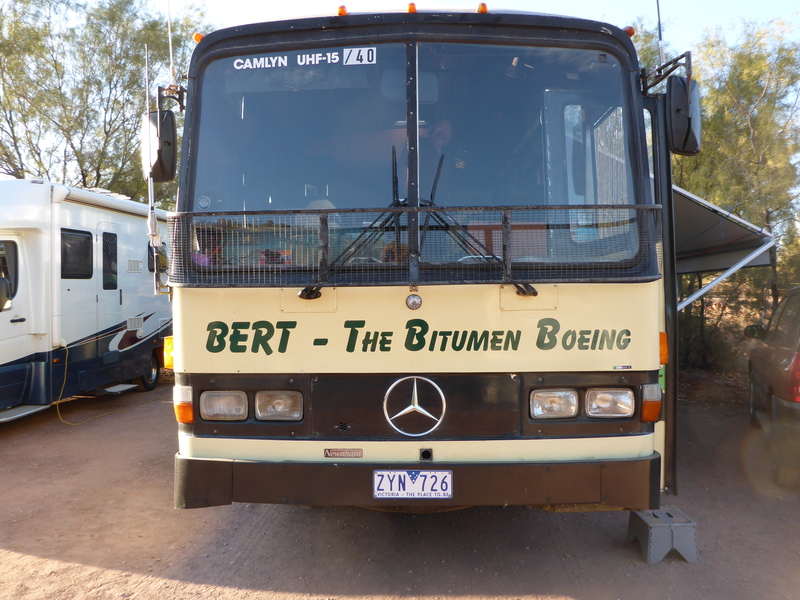 ‘Bert – the Bitumen Boeing.’ Very droll. I rode straight to Kings Canyon camp site next day, travelling along the $5 Mereenie Road in the process. It was easily the worst dirt road I’ve been on so far and some of the things the woman at the visitor centre said began to make sense. I’d bought my permit from Glen Helen camp site, no questions asked by them, and almost regretted it except that the alternative was a long diversion. The corrugations on this road were absolutely appalling. I kept thinking ‘My poor bike!’ I was worried about losing some of my teeth but luckily they’re firmly screwed in. Bend ahead. On the Mereenie Road. The camp site at Kings Canyon charged more than last night’s, but was a whole standard above it and ‘only’ charged 1% for credit card use. Better, but still not good. Once set up I headed off down the road to see the canyon. There are several walks to choose from but I wanted to walk round the canyon rim. The sign said it was a 5.5kms walk and would take 3-4 hours. That was at 15.30 and the sun set at 18.30. I’ve usually found this information to be pessimistic and I was confident I’d have enough time. The sign was right about one thing though. It said the path up to the top was steep and it was – very! Natural rock steps combined with man-made ones. I had to rest halfway up but once there all was good. The track around the rim was very rough though. I had to keep scrambling up and down rock steps to get around the various natural obstacles. 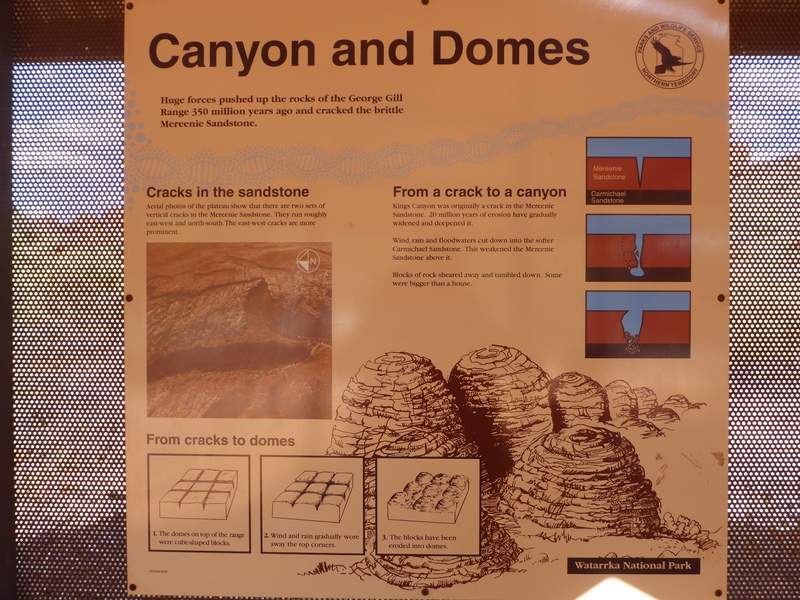 I was fascinated by the rock formations and there were plenty of info boards to explain things. Much of the surface was flat rock but there were plenty of high sections, not yet eroded away, and domes too. To me it’s fascinating to see 360 million year rock that’s been eroding probably for twenty million years, a bit at a time. In maybe another twenty it will all be flat, like the land around it. Personally I don’t believe there’ll be a single human being left to see it. So enjoy it while you can folks! A canyon with some domes. The canyon is a geologist’s and naturalist’s delight. 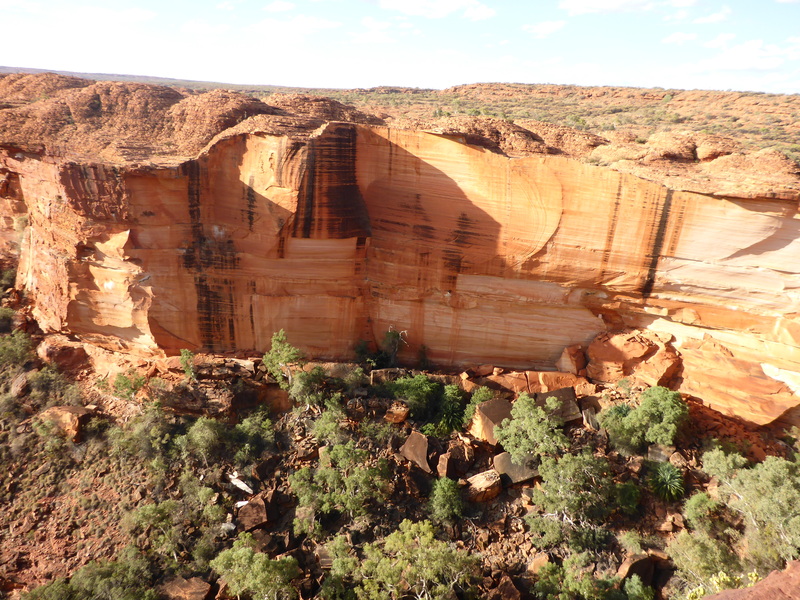 There’s two types of sandstone with a layer of shale trapped between them.The shale prevents rain water leaching all the way through the sandstone so it gets released in various ways to provide sustenance for flora and fauna. It is, of course, an important place for Aboriginals too. There are various viewing points so it’s possible to see the cliff faces and learn about the significance of the various features. Initially I was walking along the north side and looking at the south wall. But when I changed sides and was able to see the north wall I was gobsmacked. The cliff face looks stunning. Where lumps of rock have cleaved away it’s possible to see the original sandstone colour, which lies beneath the coating of red dust. This makes fascinating patterns and I was happy to sit there for a while and just take it all in. The north wall of the canyon. I loved it. Near the end of my walk I met up with a young French guy, currently cycling his way around. We chatted as we walked down and I was very pleased when he asked me if I played sports as I seemed very fit. I felt complimented at the suggestion, and who wouldn’t? I get ‘em where I can these days. How long did the walk take? 2.75 hours, and I stopped often to divert and look at things. I was pleased with that. Another of my canyon companions. I actually managed to beat the two hour deadline for leaving a camp site next morning, and was away by 9am. I don’t know why I rushed though. All there was for me to do was ride, ride and ride. 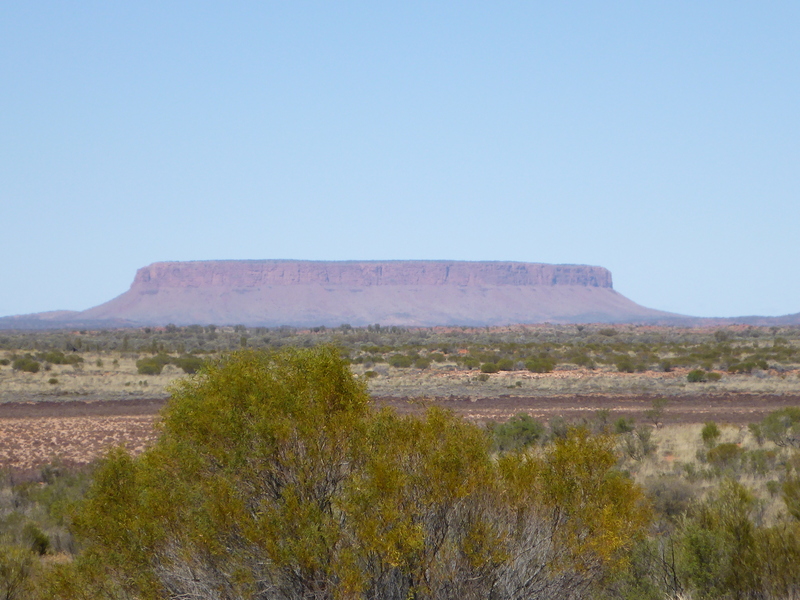 I was heading for Yulara, the nearest accommodation to Uluru-Kata Tjuta National Park, wherein lies Uluru, or Ayers Rock. This is a resort town, which means its sole purpose is to provide a variety of accommodation, dependent on taste, budget or both. The Outback Pioneer Lodge offered rooms or dorms so I’d booked a dorm bed for two nights. I arrived around 1pm but wasn’t allowed into the dorm until 3pm, so I asked the guy on reception if I had enough time to visit the rock. He said yes, so I put my luggage in the store room and headed off to the national park, about 12kms down the road. 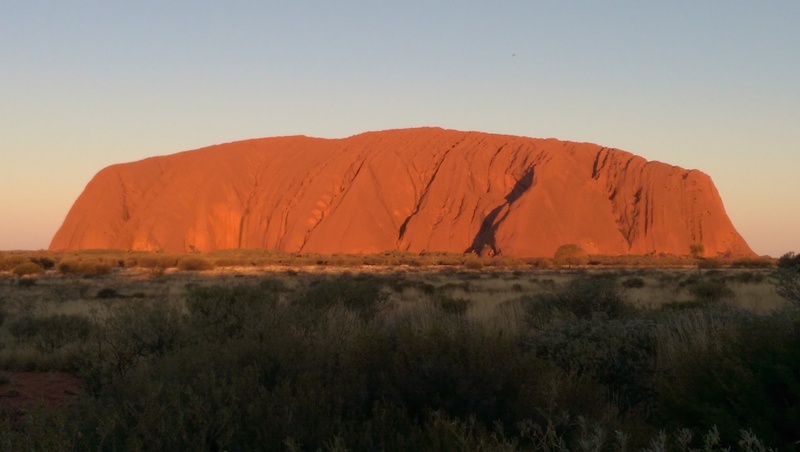 I’d already seen Uluru from the road as I rode in and was looking forward to a closer look. It’s $25 for a three day pass into the park, which was fine as I intended to come back next day. There’s lots to see. First view of this big rock, from about 50kms away. I think we all accept that Uluru is amazing. It’s iconic and deservedly so. But you can’t appreciate it until you see it close up. I went to the cultural centre first and read about the traditional owners’ culture. There was also a video about the rock’s modern history, but I didn’t have time to watch all of it. I headed out to the start of the Base Walk, as far as I’m concerned the ‘must do’one. It’s 10.6kms and 3.5 hours. Another challenge to my fitness. 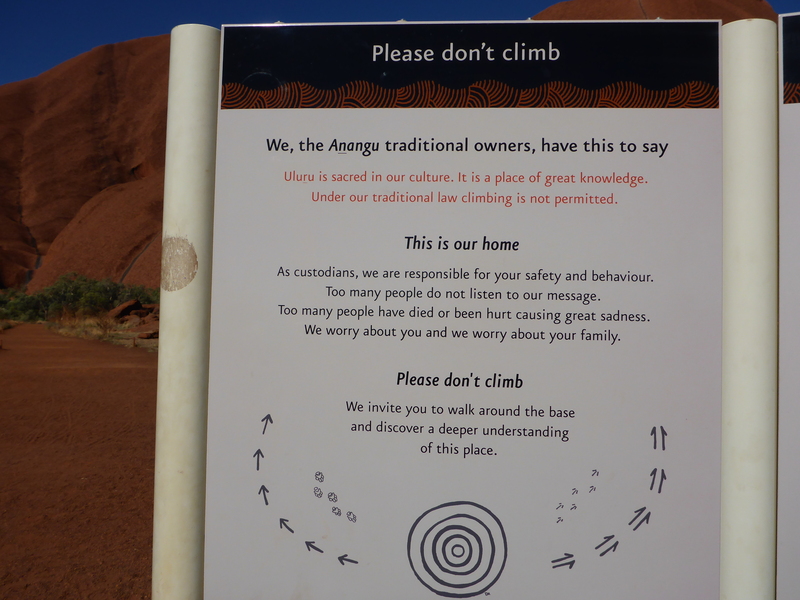 There is a stairway/climbing track up the rock but the Aboriginals view climbing it as disrespectful to the rock and the culture surrounding it. So do I climb or not? The decision was taken from me as it was closed due to high winds. I wouldn’t have climbed anyway because I simply didn’t have the time. Request not to climb the rock. The walk around was tough, on a hot afternoon, but I enjoyed it very much. There were sections where signs requested you not to take photos out of respect for local culture, which believed that certain aspects of it should only be shown to those who need to know and at the appropriate time. 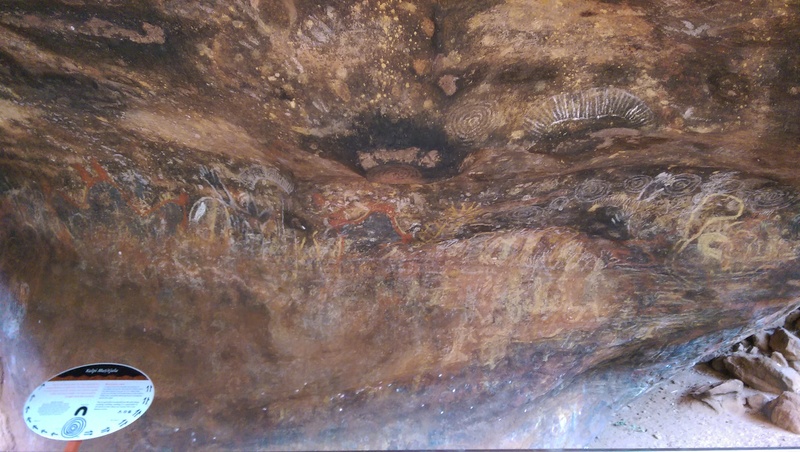 The rock features heavily in their Dreamtime stories and the info boards explained these. Stories are woven around many of the natural features of the rock and involve various animals. Two of the favourites seems to be the snake and the lizard. It’s quite easy to see how the features of the rock tie into the stories once it’s pointed out to you. It looks like the mouth of an animal and will have been woven into a Dreamtime story. There are certain areas which were used as ‘schools’ for the children. Grandparents would take girls and boys, separately, to certain areas where they would watch and then try activities such as food preparation and cooking, for the girls, tracking and hunting for the boys. This is common in many cultures but I’ve mentioned before that it’s the role of youngsters to care for their grandparents and clearly this is how the bonds are formed. What a fascinating place and well worth the trip out to see it. Being so close to it makes it easy to understand its draw and why it’s so important to local people. I finished my walk in time to stop off at the designated area for sunset viewing. The light on the face of the rock changes as the sun sets and looks marvellous. I hesitate to say it, but I was low on battery power for both camera and phone once more. I can charge both from my bike via a 12v socket but had forgotten to do it the previous night. I just about had enough for what I needed though. Me, Doris and The Rock at sunset. It’s impossible not to be affected by the rock, even if only temporarily. ‘But it’s just a big rock, sticking out of the ground, right?’ Wrong! Back at the hostel I got my gear and headed for my bunk. I couldn’t be bothered to cook so went to the bar and got a cheap fish and chip meal. 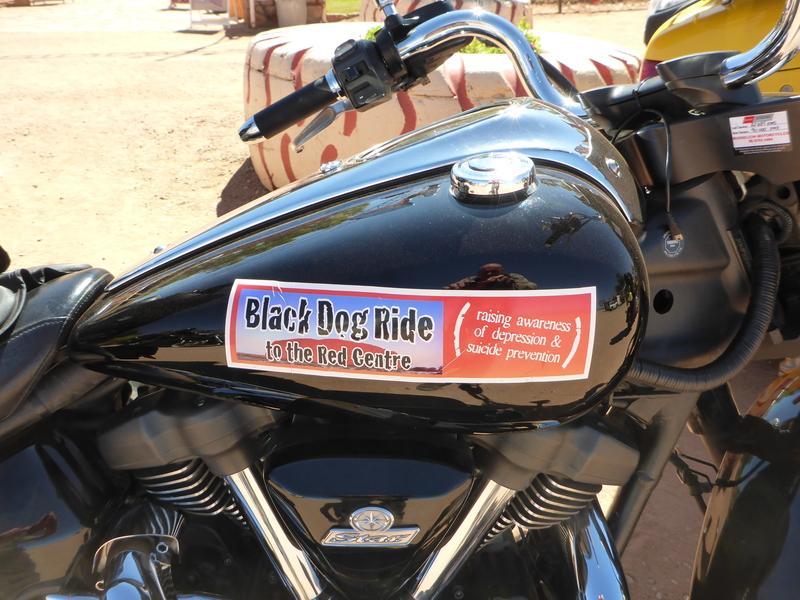 The lodge was crowded with bikers who’d attended the weekend’s Black Dog Rally. This event is in aid of a charity whose aim is to raise awareness of depression and how it can lead to suicide. A worthy cause in my opinion. More details here. http://www.blackdoginstitute.org.au. Black Dog Rally attendee. Well done all. Once back in my room I connected to the internet, having been off grid for two days. And all sorts of strange things came at me off the web. I’m writing this blog post six weeks after the events up at Cape York, and two and a half weeks after the media storm that came my way. So I’m just going to insert what I wrote soon after that storm, having originally intended to post it seperately. Once again I’m going to have to break away from the blog timeline to talk about more recent events. 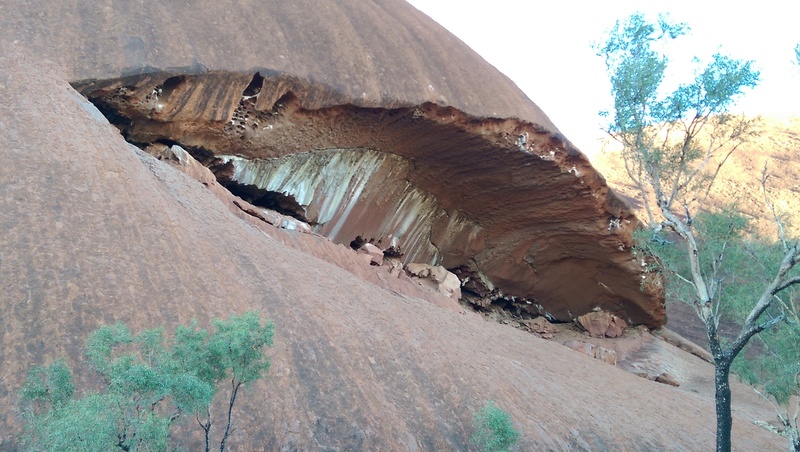 The last blog post left me near the tip of Cape York but these events happened while I was out visiting Uluru (Ayers Rock). They took place four weeks and 2,000kms after my Eliot Creek misadventure. I’d reached Yulara, the resort near the National Park, at about 1pm. 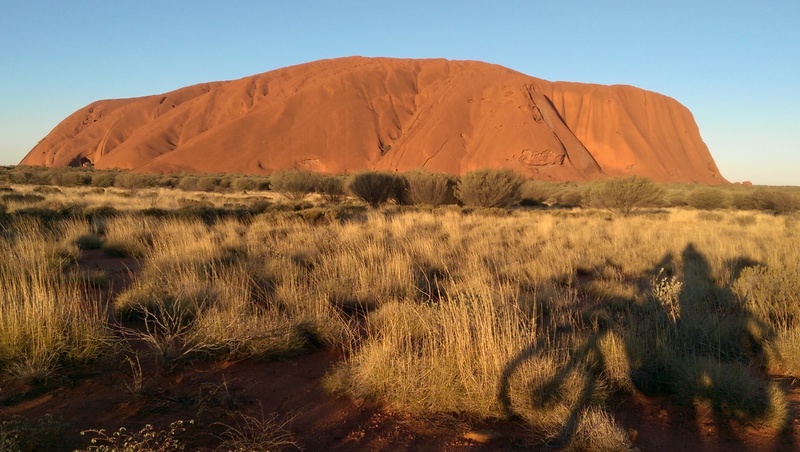 I wasn’t able to get into the dorm in the hostel so I rode down to Uluru. That was lucky because I wouldn’t have had a chance to do so the next day. I’d been off grid for a couple of days so was completely unprepared for the frenzy that overtook me during the next two. When I published my story, Swimming Against the Tide, my nephew’s wife was so taken with it she decided to contact a Sunday Mirror (UK national newspaper) journalist to tell him about it. She told me what she’d done afterwards and said that he would be emailing me to talk to me about it. 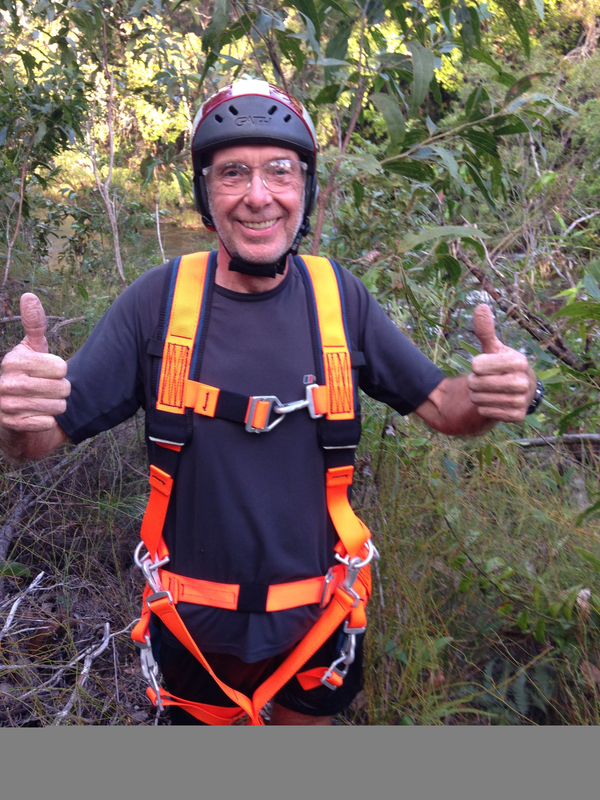 I didn’t hear from him before I left Alice and as I couldn’t be contacted before his deadline he just lifted the information and photos from my blog and ran a story about a British tourist lost for two days in the Australian bush, then saved in a dramatic rescue. The story was picked up by many other UK newspapers, either in print or online. Well, when I finally got on the internet Sunday evening I had messages, via the comments section of my blog, from all sorts of media outlets in Britain. TV and radio stations were keen to talk to me for their Monday morning breakfast shows, some offering me money to appear via Skype. It took me all evening to go through the requests and I took the decision to talk to anyone who wanted me to. I installed Skype on my laptop ready for several interviews lined up for the next day. 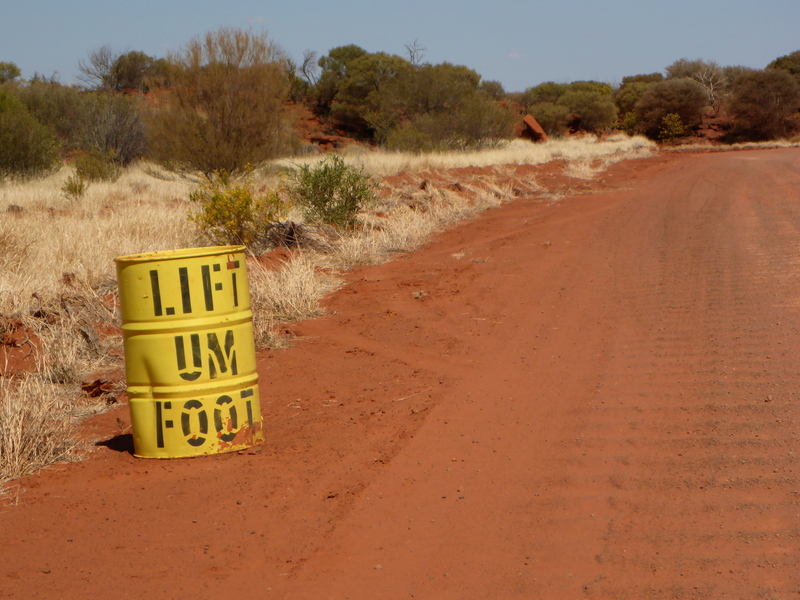 These were to be in the morning, UK time, which meant in the afternoon Uluru time, eight and a half hours later. I was at a loss to understand what all the fuss was about. Time and distance had pushed the events out of my mind but something about the incident seemed to tickle the media wherever it is they like to be tickled. I was suddenly very popular indeed! That afternoon I had a fine old time talking to Sky’s Sunshine Show, ITV’s Good Morning, ITN, BBC London TV, Radios 4,5 and BBC Kent. Over the next few days I also spoke to two of my local Dartford papers, the News Shopper and the Kent Messenger. I also appeared on KMTV, which I believe is internet based. Within a couple of days the story had been repeated all over Europe, some news sites in Russia and Africa, and even in South America. I couldn’t believe what I was seeing on my blog as various news outlets picked up the story from it and linked to it. The traffic to my blog on the Monday was simply incredible. There were over 16,000 views from nearly 13,000 unique visitors. Normally, after uploading a new post I’d get a few dozen. Wow! To me it was madness. Even so, I’d be a liar if I didn’t admit I enjoyed my fifteen minutes of fame and one of the nice things was that it put me back in touch with some old friends and colleagues after they saw me on the TV or heard me on the radio. I’ve also picked up a number of new blog followers. At the same time I apologise to any of my relatives, especially my children, if it brought them any unwelcome attention. There is still some media interest, with an interview lined up with a women’s magazine in Australia and maybe one or two more yet to come. I feel very grateful to my rescuers but because they are tax payer funded I can’t repay them. Instead I am going to donate any monies received to the Royal Flying Doctor Service here in Australia. While I’m catching up on these events I think it’s worth sharing the most interesting comment I’ve ever had on a blog. It came from Mischa Hadolin, the pilot of the rescue helicopter (which happens to be a Bell 412, if anyone is interested). He seemed delighted to have the opportunity to tell his side of the story. I can do no better than to quote it verbatim. Coming into the chopper, feeling chipper. My name is Mischa and I was the pilot of the Rescue Helicopter that afternoon. I saw your blog as part of the News article and was very interested to read your side of events; it is not one that we usually hear. I thought you might also be interested in our perspective too; the winch Rescue we conducted was a challenge. For our Helicopter to be tasked to conduct a winch rescue means that no other practical means of recovery is possible. This was certainly the case that day. On our way down to your position, we went through a full mission briefing that included planning for scenarios that could potentially take place during the task. You’ll be thankful to know we were equipped to do that same recovery at night should it have been required. After discussing our plan with the SAR Co-ordinator on the ground (Brad) both Helicopters lifted off to your position. After we confirmed where you were located, we moved in slowly until Matt, the Aircrewman and Winch operator spotted you: ‘Visual! 2 o’clock low before the bend’ he exclaimed. At this point, I handed over what is called the ‘con’ to Matt. As the Helicopter is quite large, it is not long before I can’t see you anymore and I am focusing on the tops of the trees as my hover reference. The ‘con’ allows Matt to verbally tell me what to do and where to go. ‘Height good maintain, move forward 10. 3,2,1, Hold. How’s your reference’ Matt asks? I reply I have good reference, however we are using 85-90% of the aircrafts power, which means we only have 5 minutes to spend in this position before we have to transition to forward flight to ease the requirements. Matt, moving with the methodical deliberation that stems from his career crewing Helicopters in the military, brings his eyes inside the cabin to confirm that Chris, our Rescue Crewman is ready to go ‘down the wire’. A final thumb up confirms this process is complete and we are ‘clear to winch’. Our main concern at this point was the downwash, and the havoc it was causing below. We had already seen some tree branches break and the re-circulation was causing Chris to ‘swing’ from side to side of the ravine. At this point, Chris is powerless to the events taking place around him; he is relying on Matt above to make the right decisions to place Chris in the intended area, only a few metres wide. As Chris feet touch the water, a quick disconnect is followed by Matt advising ‘Rescue crewman on the ground, retrieving the hook. Hook is housed, clear to roll’. ‘Roger, rolling’ I reply. We then move into a holding pattern above to discuss the events that took place as well as checking in with Chris on the ground. Matt and I ran through a short de-brief of events to clear up any concerns we have prior to continuing. Our main trepidation is that of the downwash; Matt thinks it has the potential to either knock you both of your feet and down the river, cause a branch to break onto you or swing into the side of the Gulley. All concerns Chris also felt on the ground. Chris continues to give us updates of his situation as we hold overhead. ’20 minutes to Bingo’ I tell the crew: the call to advise the time remaining on scene before we have to re-fuel and try again. Chris and Matt are busy devising a plan for a new winching position that will reduce the possibility of our downwash hampering our efforts of recovery. Finally, the radio comes to life again ‘Rescue 700, this is Rescue Crewman, safety checks complete and ready for double winch extraction’. ‘Roger’ Matt replies, ‘Inbound in 30 seconds’. Chris has assessed the scene and chose the best possible place to conduct the recovery; Matt and I were both very proud of his judgement and decision making under pressure at the moment. It is always a surreal feeling when it is all over and I look back to see the person, you in this case, being pulled into the aircraft. It is a mixture of elation and relaxation that is hard to compare to anything else. p.s We also have some pictures and footage of the event should you require it. On behalf of Rescue 700. So, back with the story once more. 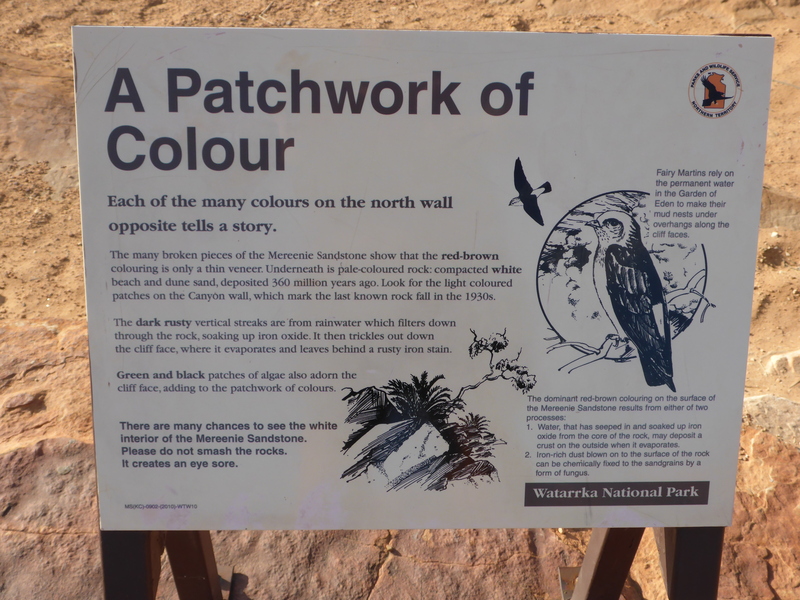 I didn’t have time to visit the Kata Tjuta section of the NP because I was kept busy on the internet. So I headed back to Alice Springs on a day that had become sunless, windy, cold and eventually wet. I stopped at a roadhouse for fuel, coffee, a pie and a warm up. I also put on some warmer clothes. Really, it was very cold. The wind was in my face most of the way which affects the fuel consumption. Down to under 50mpg (17.5 kms/litre). Easily the worst of the whole trip so far. Seen at the Servo en route to the Truck Reunion. 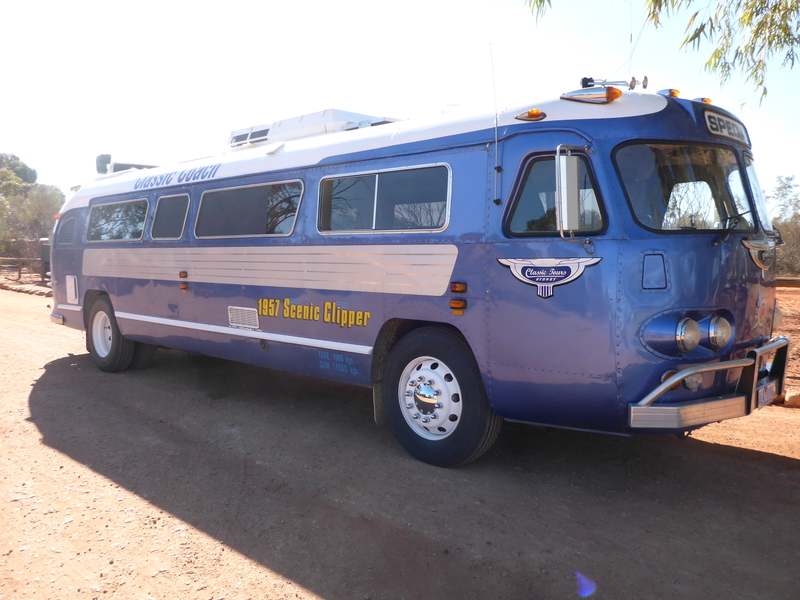 A 1950s Clipper Coach, now a camper van. I’d had to book a different hostel in Alice as the previous one was full, and it turned out they’d messed up the booking. As things stood I had nowhere to stay on Friday night. The town was full, as predicted. A busy weekend in Alice then. I was now at Alice’s Secret hostel but after a day or so a room became available back at Alice Lodge, so all was well. I booked to stay there until Monday so I could prepare for the next stage of my trip. I visited Heidi at Alice Lodge as soon as I got back and she handed me my newly arrived fuel bladder, then insisted I attend the Thursday BBQ, even though I wasn’t staying there. How kind, but now I needed to buy cake! I met Den at Alice’s Secret. 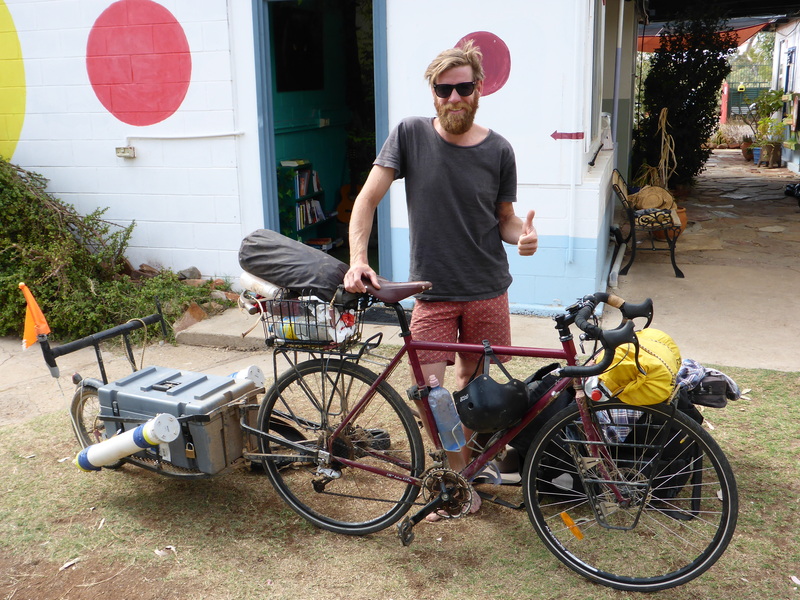 He’s cycling his way around Aus. Some preparations had to be made for when I left Alice and these included a new rear tyre and the hunting down of some cans for fuel. I already had one, as well as my 5L fuel bladder, but I needed more. I was going to ride the Tanami Track and had over 600kms to cover with no fuel supply, so I had to be self sufficient. With a bit of asking around here and there I eventually got what I needed. Researching fuel and water availability led to my decision to stay in Alice until Monday as the supply places had restricted opening at weekends. A wise decision in the end. Over the next couple of days I replaced my rear tyre, the other one having covered 7,000kms. That doesn’t seem like much but it was a lumpy dirt tyre which had seen some hard use on both sealed and tough dirt roads. It actually did quite well. I spent some time trying to clean the zips on my tent. Constant use in very dusty conditions seemed to have jammed them up. Time would tell if I’d been successful. I got a map of the Tanami Track from the visitor centre and then checked at the police station that the information was up to date. Everything was coming together nicely. One of a whole complex of buildings at the Telegraph Station. They had to be self sufficient in many ways. Last time I was in Alice I’d failed to succeed as a tourist so this time I was determined to get it right. 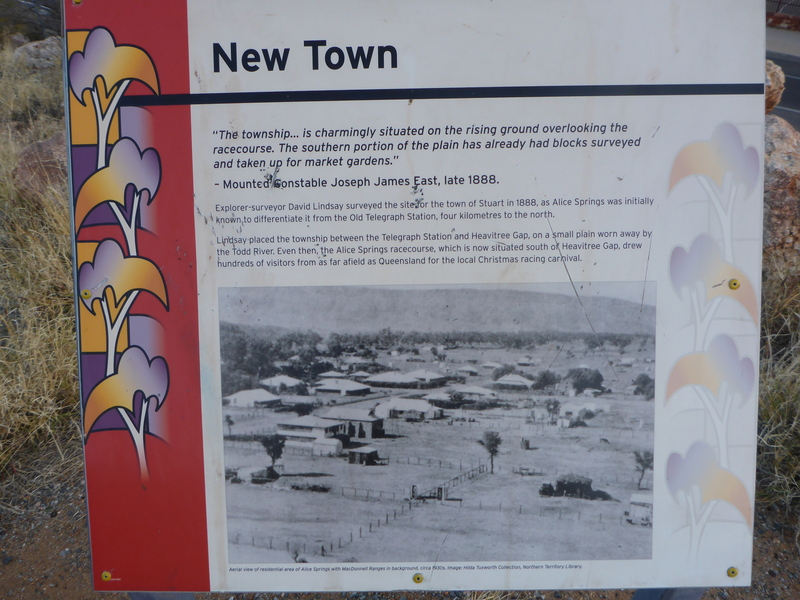 It’s an interesting town and was founded because of the new telegraph line. It was originally called Stuart but adopted its new name in 1933. 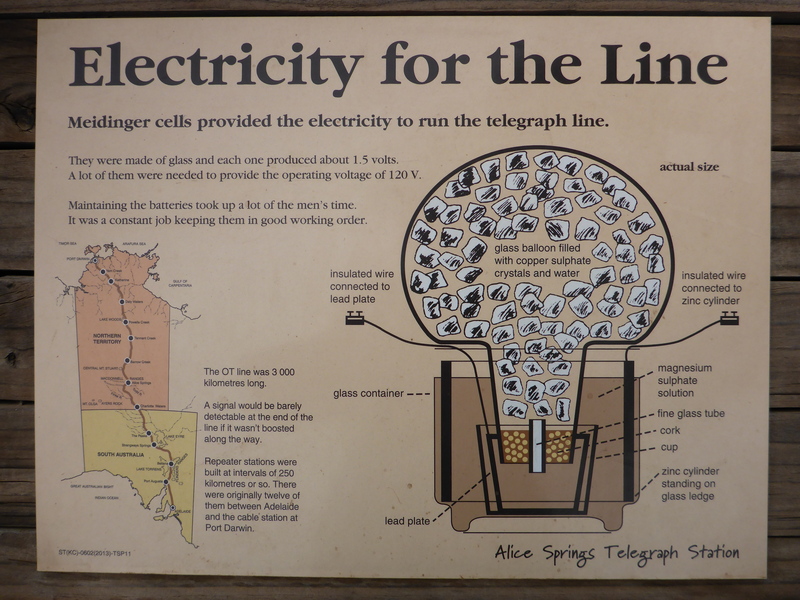 The original Alice Springs was the name given to some waterholes south of the town near where the telegraph station was built. The station came to include a post office and police station while the nearby town grew off the back of prospecting, gold mining and cattle. A railway to Adelaide was built and the motorised road train was first developed here. 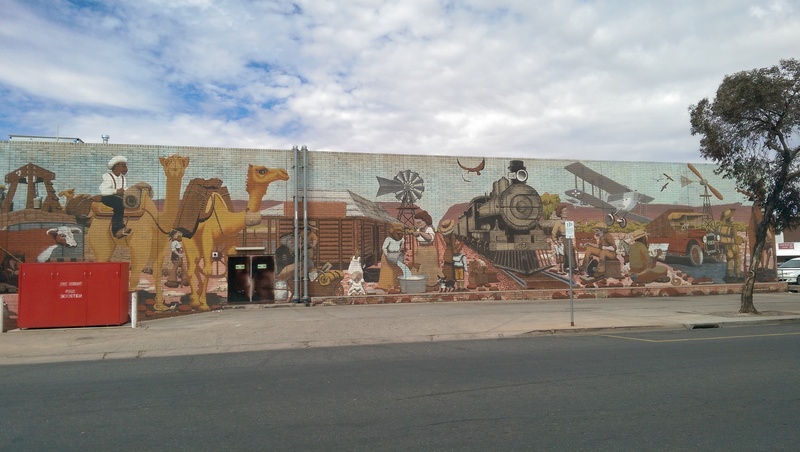 The town’s attractions include a National Road Transport Hall of Fame, truck museum to you and me, which reflects this heritage. The truck reunion takes place every five years. I was looking forward to seeing that. I walked down to the Old Telegraph Station once more, remembering to take some money this time. It was interesting to learn how the line was built, the role of the repeater stations and what was involved in running them. The original equipment was on display with plenty of info boards to explain how it all worked and how it was used. Power for the signal. Ever heard of one of these? Me neither. 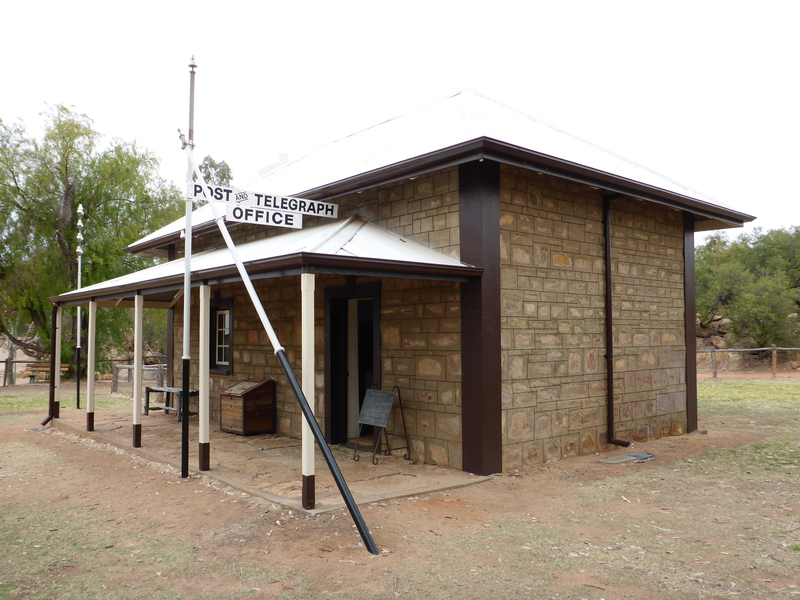 Eventually the line was replaced with telephone cables, the post office and police station moved to the town and the telegraph station was used for other purposes. Shamefully, one of these was to house children who had been, literally sometimes, snatched from their Aboriginal mothers. Because they had fathers who were European, or half European, it was deemed unsuitable for them to be brought up in an Aboriginal family. This appalling act of racist social engineering is one of Australia’s most shameful episodes, as you can probably imagine. I’ll write more about this topic another time. 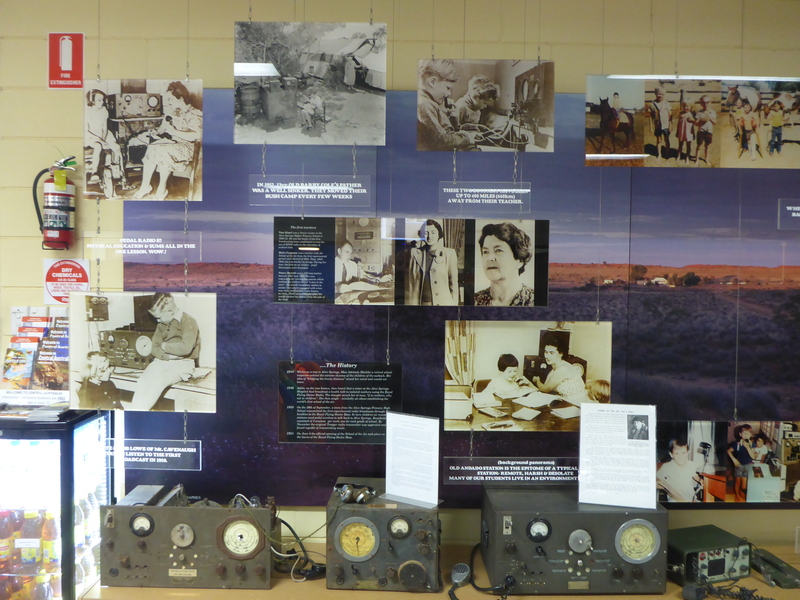 Two other places I visited were the Royal Flying Doctor Service HQ and the Alice Springs School of the Air. Both of these are services which came about because of the need to care for and educate outback settlers and their families. They both started in the 1930s and have grown to meet the needs of remote settlements and cattle stations. They use the best available technology and are hugely successful. 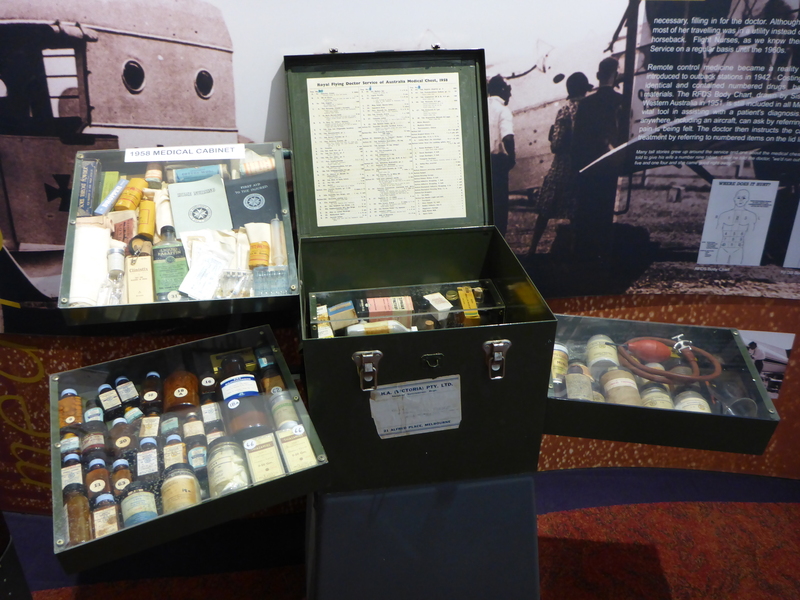 Very comprehensive medical kit, and instructions, issued to cattle stations and small settlements. The RFDS provides medical kits to cattle stations, with full instructions on how to use them, as well as being able to give medical advice over the radio in the event of emergencies. The idea is to keep a patient alive until a plane can get there. Doctors and nurses fly into communities on a regular basis to provide clinic services to small settlements. The service also provides Air Ambulance transport when patients need to be moved from one hospital to another, if necessary. I’ll be very pleased to donate the media’s money to it, if any is eventually forthcoming. In the same vein the School of the Air educates children who live too far away from towns to attend school. Parents are heavily involved in their activities and the national curriculum is used. Having started with pedal powered radios (PE and school work at the same time), the service now uses a private, satellite based system and will provide equipment to the families for the duration. Tutors hold sessions with small groups, broadcasting from the HQ in Alice. The children visit their nearest town for activity weeks three of four times a year and will usually go to boarding school for sixth form. There are a number of such schools around Australia but this is the largest because Alice is in the middle of such a vast, unpopulated area. Both services prove that necessity is the mother of successful invention. School of the air, growing fast. I took another sunset walk up ANZAC Hill, with fully charged batteries this time, and got some nice shots. The walk up from the main street involves steep, rocky steps and I was quite surprised to find several not so young women running down them. They ran back up the hill via the access road to the car park and then ran down again. I saw this at least three times. Some kind of race I suppose. Tough Mothers though! At the hostel I had great conversations with two different groups of people. 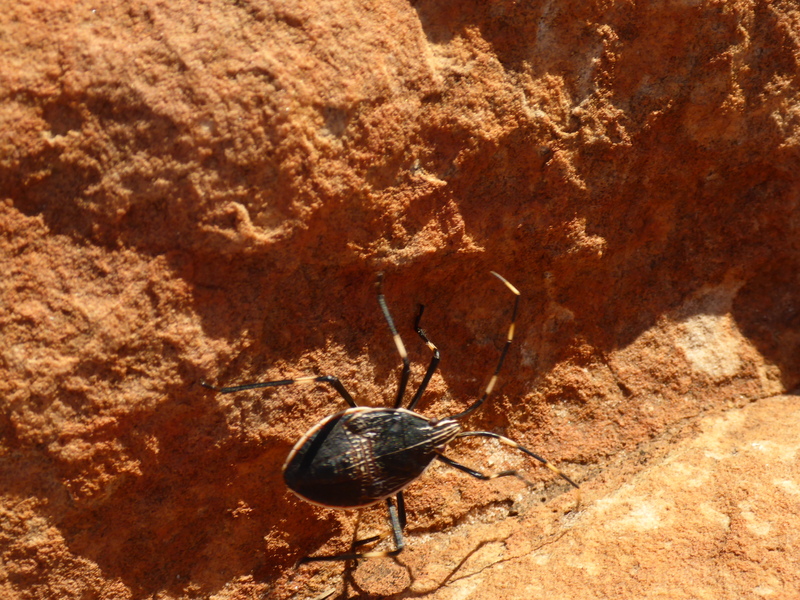 The first were around my age and had been in the area to walk the Larapinta Trail. 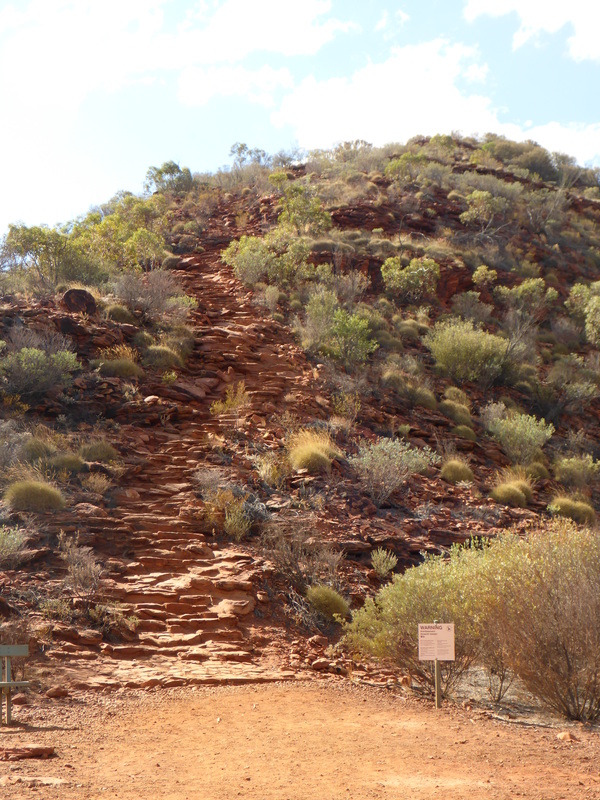 This is a 223kms track which goes through the West MacDonnell range. It’s an iconic walk for Aussies who like that sort of thing and is hard going. 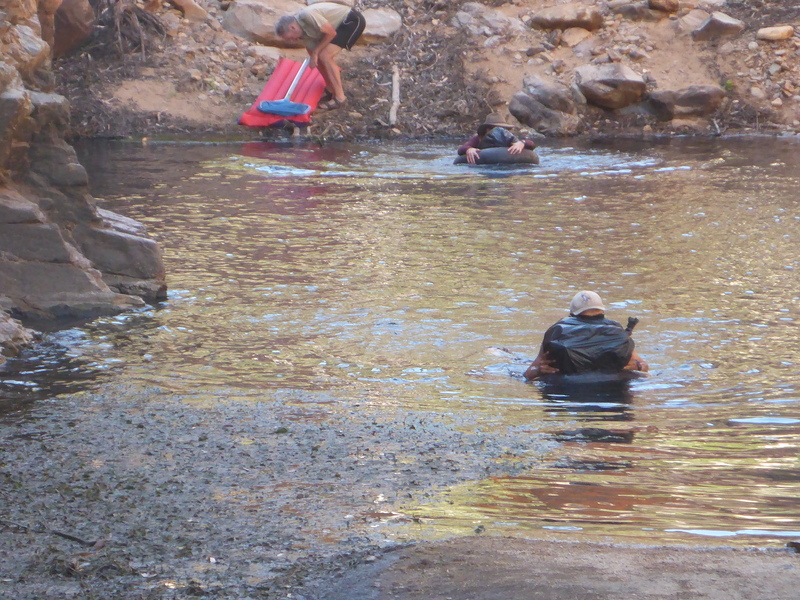 This group had walked it the hard way, carrying all their gear with them and camping out. I was impressed. I also got more contacts for when I’m in the south, from around Sydney this time. The second group was a French family, a couple and their two daughters of around 10 and 8. They were taking a year out to travel Australia and had just hired a camper van for a few weeks. Their daughters were loving it and who could blame them. They were, however, keeping up with their school work via the internet. Great to see. The sun goes down over Alice. I’d come to like Alice Springs a lot. Plenty to see around and about and it works brilliantly as a base from which to explore. There was a good shopping area and all the support a traveller could need. There’s still one event to write about before I leave the town though. More soon.